Imagine that one day you decide you need a new hobby. Then it hits you: “What if I made a galaxy?” It would certainly be a long project, sure to take up a lot of your free time. Resources might be an issue, but imagine the envy of your friends when (ten billion years down the line) you get to show off the finished product. Yup, this definitely sounds like a good idea – better try to figure out what it would involve. First you need to decide what kind of galaxy you want to make. Galaxies come in all shapes and sizes, but broadly speaking they split into two categories, each of which have a plethora of names: on the one hand you have Early-type galaxies/elliptical galaxies/red-sequence galaxies – call them what you will, they are fairly featureless, are populated by old stars with no ongoing star-formation, and look red in colour (because all the hot, blue stars with short lifetimes have either exploded or evolved into red giants, leaving a galaxy full of red dwarf stars and red giant stars). On the other hand, you have Late-type galaxies/spiral galaxies/blue cloud galaxies. Ongoing star-formation means they contain young blue stars, so overall they look bluer than Early-type galaxies. These are the galaxies with dramatic spiral arms arranged in a thin disc. They tend to rotate faster than Early-type galaxies too. The names Early-type and Late-type are somewhat misleading, a hangover from old theories of galaxy formation which suggested that blobby ‘early-type’ galaxies eventually settle down over time into nice orderly discs with spiral arms, i.e. ‘late-type galaxies’. Unfortunately, if anything, those old theories got it backwards! It turns out that galaxies crashing into each other and settling down into one composite galaxy (a galaxy merger) is pretty common. It’s this process that can convert the orderly Late-types into messy elliptical Early-type galaxies. The terms ‘red-sequence’ and ‘blue-cloud’ are perhaps more accurate, but require some explanation. These are observational classifications: you measure how bright a galaxy is, and how blue/red it is (colour actually has a rigorous definition in astronomy: without going into details, it’s the difference between how many blue photons and how many red photons you count when you look at a galaxy) and then plot the brightness and the colour against each other. Early-type galaxies form a nice, tight sequence in this plot: brighter, bigger galaxies are redder. Separate from this ‘red-sequence’ is the ‘blue cloud’, a fairly amorphous blob of Late-type galaxies with bluer colours and ongoing star formation. These are shown in Figure 1. Few galaxies lie between the two. Figure 1 – A cartoon version of the red sequence and blue cloud, showing how running out of gas leads to galaxies migrating onto the red sequence. Red-sequence galaxies then merge with each other (a ‘dry’ merger is when galaxies which have both already run out of gas merge together: this means the merger doesn’t lead to fresh star formation) to ultimately form massive elliptical galaxies. Today’s paper is all about figuring out how to make red-sequence galaxies. Think of it as a kind of instruction manual for your new project! The authors first discuss the current scientific consensus. When the universe was young, slightly denser regions collapsed under their own gravity to form blobs of dark matter with a range of sizes, into which gas fell. This gas formed stars, some of which exploded as supernovae, creating heavy elements and driving gas out of the young proto-galaxy. Some of this gas (which is chemically enriched by the debris from the supernovae) then fell back under gravity and was made into new stars. The key point here is that the bigger proto-galaxies had stronger gravity and so retained more gas, with the gas also falling back more quickly. Hence the bigger proto-galaxies are able to go through more cycles of chemical enrichment before they run out of gas (the key role of galaxy mass has been highlighted before on astrobites). When the galaxies finally run out of fuel for further star formation (either because it got used up or because it was driven out), we say star formation has been quenched. What you’re left with is a compact ‘red nugget‘ with no ongoing star formation. This doesn’t actually bear much resemblance to a modern-day elliptical galaxy, which are not particularly compact. If we’re going to make our own, we need to figure out how to get from one the other. A combination of simulations of galaxies merging and observations have been used to more-or-less crack this problem. The only way to fluff up a red nugget galaxy into a massive elliptical is to crash a lot of galaxies into each other. But there are some caveats. Galaxy mergers come in several types: they can be ‘dry’ or ‘wet’ (if the colliding galaxies contain gas which can be used to form stars it’s a wet merger, and if they’ve both already used up their gas it’s a dry one), and they can be minor or major (major mergers are when the two colliding galaxies are more or less the same size, minor mergers are where one is significantly smaller than the other). These are the kind of practical things we need to know if we’re going to build that galaxy. It turns out that only dry, minor mergers will do if you want to make a really impressive massive elliptical galaxy. Anything else either rejuvenates the galaxy (kicks off fresh star formation and brings it back into the blue cloud) or fails to inflate the galaxy’s size in the correct way. A minor merger adds a bunch of energy (allowing all the stars to take wider orbits around the galaxy) without adding too much extra mass (which would bind the orbits more tightly). The authors’ aim is to find out what ratio of galaxy masses were typical in the mergers that formed real galaxies. They are pioneering a new method for doing this, which relies on the fact that really massive red nuggets – the seeds of massive elliptical galaxies – are much more chemically enriched than their smaller counterparts with which they later merge. The idea is that since these are dry mergers, all the stars formed at around the same time. 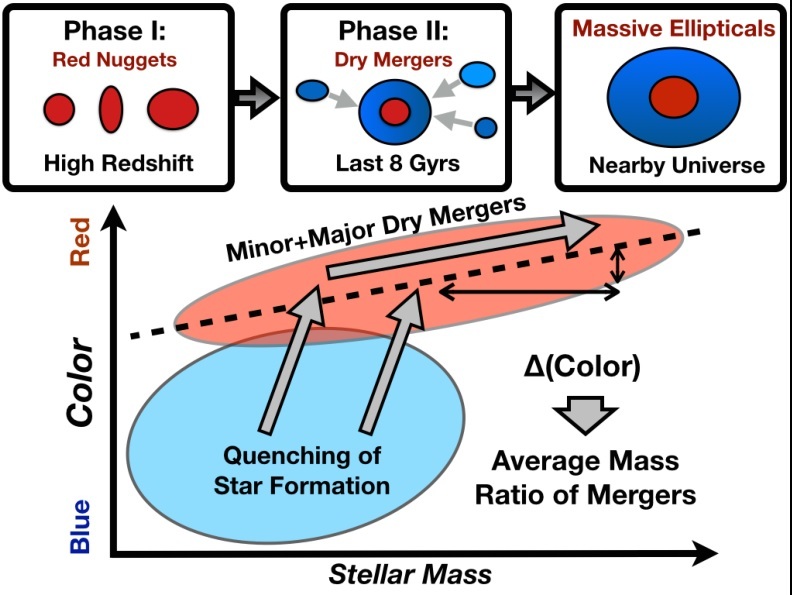 However, the stars in the outskirts of massive elliptical galaxies will have come from small systems, while the stars in the core will be those from the original big red nugget. I’ve already said that how blue or red a group of stars appears depends on the age of those stars, but if they are all the same age a new effect comes into play; chemically enriched stars appear redder because of an effect called ‘metal line blanketing‘, which just means that heavy elements absorb blue light preferentially. The upshot is that if you assume all the stars are the same age and you measure the colour of the core and the outskirts of a massive elliptical galaxy, you can infer how chemically enriched the two regions are – and hence how massive the proto-galaxies that the stars formed in were (for the outskirts, this will be an average since they are built from many small galaxies). The ratio of these ought to tell you what the average ratio of masses in the mergers that grew the galaxy was, or in other words just how minor your mergers need to be. Applying this technique to the Carnegie-Irvine galaxy survey of nearby bright galaxies, the authors are able to conclude that nearby massive elliptical galaxies formed by piling on lots of galaxies about five to ten times smaller than the central red nugget. This is broadly in line with previous results (see Figure 2), which is good news for the method the authors have devised. Figure 2 – Results: the orange and blue lines and bars show the various results the authors obtain by implementing the method in different ways. 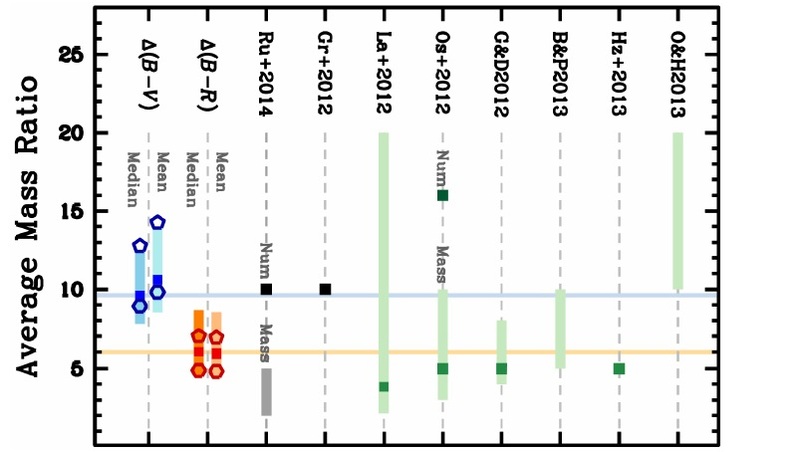 Also shown are observational results obtained through other methods (grey/black) and the predictions of simulations (green). The authors’ method is in broad agreement with the work others have done. So to summarise: if you want to build an elliptical galaxy, you need to start by dropping a bunch of gas into a blob of dark matter, the bigger the better. Leave to simmer for two billion years or until star formation ceases. Repeat this many times with much smaller amounts of gas and dark matter (five to ten times smaller), then drop them onto the red nugget you made first. Do this over the course of eight billion years or so. Be sure to keep your red nugget isolated from outside sources of fresh gas, or you might accidentally make a spiral galaxy instead. Voilà – one seriously impressive elliptical galaxy.